Tom grew up in Los Angeles and, thanks to his Scottish-born father, was always interested in trying to make a career out of playing football. He moved to Edinburgh in 2006 to pursue this goal and played in the lower leagues for three years, during which he added two league titles to his collection. Tom has always been a techie at heart and it was no surprise to anyone when he went into product development soon after retiring from football. He headed up the initial mobile application development at thetrainline.com before electing to work on his master’s. Tom completed his MBA at Cambridge, where he focused on entrepreneurship and strategy. 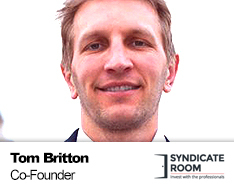 While Tom heads up the technology team at SyndicateRoom, his skills and experience ensure that he does a lot more than just that. In his spare time Tom volunteers for Camp Footprints, rock climbs and still plays the odd five-a-side game (when they don’t make him play in defence).